I recently met a beautiful woman carrying her adorable, chubby cheeked baby in a fun, brightly colored ring sling. He was happy as a clam snuggled up close to his mama, and she was comfortable and happy. I complimented her on her carrier and she mentioned that she flips the tail around so no one can see the ring sling label. When I asked her why she explained that she was around some other baby wearers and they had a lively discussion about how they also “started” with a ring sling just like hers, but then “they moved on” to wrap conversion ring slings. Since then she has been a little embarrassed of her ring sling, especially in the company of what she called “real” baby wearers. As you can imagine, this conversation struck a chord with me. In fact, it is one of the reasons I started this blog in the first place! The idea that a person would feel “less than” because her $80 carrier supposedly isn’t up to snuff? According to whom? It makes my heart hurt. It doesn’t matter if you have 30 “high end” carriers or you use a bed sheet to wrap your baby. If you babywear, you are a babywearer. 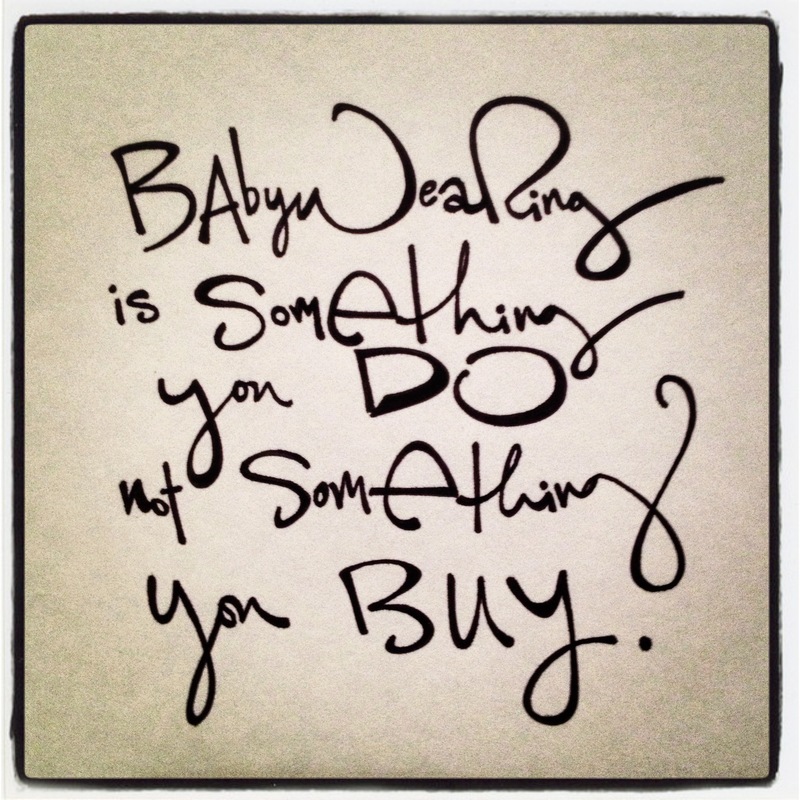 Babywearing is not something you BUY. It is not something you own, it is not a product. Babywearing is something you DO. It is the special closeness shared between you and your child when you hold them in a carrier. It is healthy, and safe, and comforting. It is an action. It is not tangible and it cannot be bought or sold. Babywearing is our experiences, our moments, and our stories; it is our lives and our love. Today this post was shared on a popular baby wearing page and I have had over 2k new visitors to this post. I am no longer actively maintaining Where We Wear, though the stories are here for you to enjoy forever! 😉 Find out what I am up to now by clicking here or come say hello over on Instagram at This (Un)Scripted Life or grab your own hand lettered piece HERE or play around on my website or if you are in the Philly area, join me at our next Mindful Woman retreat. 🙂 OR,if none of that appeals to you, just have an amazing day and enjoy your baby! I’m not saying it is bad or wrong to spend your money on a wonderful stash of carriers. I have a stash (small but mighty). I am just saying lets remember it is about our babies and not the carrier. Been babywearing for 19 months now and I have to admit it has been hard to not get caught up with the hype of it all. I am now a manufacturer of a carrier. And I love that my customers love my product just as much as I did when I was just using my “homemade” carrier with no “brand”. It was comfy and I loved it! But I never did feel like I fit in at babywearing meetings because I didn’t have the latest or greatest and couldn’t talk the lingo. I loved babywearing just as much as them but still felt out of place. So I can relate to that mama. It is kinda ironic that my carrier is now at lots of babywearing meetings across the country now. 🙂 I love providing an option for babywearers on any budget! I love your story Elizabeth! I can relate. I guess in some ways this is my way of carving out space some can all fit in a little better, especially when we are sharing something so personal and deep as how we bond with our children, how we chose to parent, etc. What kind of carriers do you make? Beautifully put. I too have come across these “collectors” as I call them. I think one of the most beautiful wraps I’ve ever seen was…..YOURS at MommyCon and not exactly a huge price tag!! ❤ this. SO MUCH. May I borrow your graphic to use as an Avi for a bit? I had a woman (she didn’t have her baby with her at the time so obviously wasn’t wearing) comment to me about the wrap I was wearing was beautiful I thanked her told her it was a new baby present. After she complemented my wrap she said something about how I was a real babywearer and she was an fake that she just had an ergo. I asked what was fake about baby wearing in an ergo that I own one too. Its not fake to babywear in an infantino, just more uncomfortable for wearer and dangling baby. I told her she was a real babywearer, this just happened about 2 weeks ago and it makes me very sad. That story is heavy on my heart Nicole. I appreciate that you supported her. I have had Ergo mamas say similar things to me. It’s so strange how the “are you mom enough?” competition seeps into everything we do. I wore my first DD in an ergo, but I also thought I wasn’t a “baby wearer” at the time. I got into wovens with my second child. I quickly realised that I had been a baby wearer all along though. How very sad! My ring sling is homemade by my mother, with fabric I bought at a discount fabric store. It has no tags and was quite cheap to make. But it will bring joy to my heart and my little one until he’s too big to fit in it. Depressing that some women have to twist a selfless act into a “beauty contest”. Lizzy, thank you! Elizabeth, that’s fantastic! I’d love to see your carriers! amen. so well said, am sick of being made to feel like a second class baby wearer because I can’t afford (and don’t want to) spend hundreds on highly sought after wraps. I just want to wear my baby close – in whatever is comfy for both of us and does the job best at the time! Turns out that yes, she would have thought I was insane. When I got a bit closer I realised the ‘unusual wrap’ was, in fact, a beach towel. This was on the school run, no beach for miles. Where we live is pretty diverse and you can occasionally see mums carrying babies in traditional ways like that. It made me laugh at myself. Women who wear their babies with whatever fabric they have handy so they can go to work must have a real laugh at silly Westerners obsessing over names and threads and resale value. If I had to choose who are the ‘real’ babywearers, well I’m not sure I’d win that one! I didn’t even use a sling when my girl was tiny. I carried her in my arms, then I carried her in a rucksack type carrier before moving on to an Ergo. Am I a baby wearer….hell, yes!!! My baby’s needs to be held physically close to me were met….how does not matter! This is how I feel. Baby wearing is about being close with your baby, not how much your carrier or wrap costs.